CanadianPharmacyWorld.com supplies only genuine Eliquis from Canada or Turkey shipped using either Canadian or Turkish packaging. This Eliquis is manufactured by Bristol-Myers Squibb the worldwide manufacturer of Eliquis. This offer is neither endorsed nor authorized by Bristol-Myers Squibb (the United States and Canadian distributor of Eliquis). CanadianPharmacyWorld.com has no affiliation whatsoever with Bristol-Myers Squibb. How and Where to Buy Eliquis? Save your money! Place an order for your Eliquis online through CanadianPharmacyWorld.com at the best possible price with free shipping. Our Canadian Pharmacy provides brand and generic RX and OTC medications online through suppliers in Canada and other countries around the world. Check out our latest Featured Products and more. Are there Alternative Names for the Brand and Generic Eliquis? The brand Eliquis 2.5mg and 5mg tablets come from Canada and Turkey is manufactured by Bristol-Myers Squibb. There is no generic available for this medication. What Dosages and Forms is Eliquis available in? What is Eliquis used for? 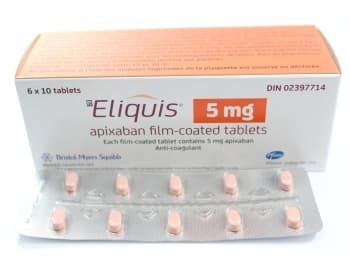 Eliquis (Apixaban) is a prescription medication that is used to lower the risk of stroke caused by a blood clot in people with heart rhythm disorder called atrial fibrillation. It prevents platelets in the blood from sticking together and forming a blood clot. Apixaban is an anticoagulant that works by blocking certain clotting proteins in your blood. Eliquis is taken by mouth with or without food as directed by your doctor, usually twice daily. Are there any Precautions and Drug interactions for Eliquis? You should not take Eliquis if you are allergic to Apixaban or if you have any other allergies. Before you start taking this medication, talk to your doctor about your medical history and about all the medications you currently take including OTC and herbal medication. You should not store taking Eliquis unless directed by your doctor because stopping suddently can increase your risk of blood clot or stroke. Eliquis should not be used during pregnancy. It is unknown if this medication passes into breast milk. There are some medications that may interact with Eliquis such as itraconazole, clarithromycin, ritonavir, rifamycins, and carbamazepine, etc. Eliquis tablets should be stored at room temperature away from light and moisture out of reach of children and pets. Do not store this medication in the bathroom. Which Anticoagulant Medication is Right for You?